Samiya Bashir is the author of three collections of poetry: Field Theories (2018), Gospel (2009), and Where the Apple Falls (2005), which was a finalist for a Lambda Literary Award in Poetry. She is also the author of the chapbooks Wearing Shorts on the First Day of Spring (1999), American Visa (2001), and Teasing Crow (2006). Her poetry, stories, articles and editorial work have been featured in numerous publications, most recently including Poetry, World Literature Today, Ecotone, HOAX, The Normal School, Poet Lore, Callaloo, and The Encyclopedia Project. Her poems have appeared in numerous anthologies, including War Diaries, Best of the Best Lesbian Erotica, and the Cave Canem Anthology: VII. She holds a BA from the University of California, Berkeley, where she served as Poet Laureate, and an MFA from the University of Michigan. Bashir lives in Portland, Oregon where she teaches at Reed College. Eisa Davis is an award-winning actor, writer, and singer-songwriter working on stage and screen. She was a finalist for the Pulitzer Prize in Drama for her play Bulrusher, and wrote and starred in Angela’s Mixtape, named a best of the year by The New Yorker. Other plays include Ramp (Ruby Prize winner), The History of Light (Barrymore nomination), Paper Armor, Umkovu, Six Minutes, Warriors Don’t Cry, Mushroom Play, and the collaborations Active Ingredients and Hip Hop Anansi. She is currently writing the musicals Flowers are Sleeping and Devil in a Blue Dress, and writes for the Netflix series She’s Gotta Have It. Eisa was awarded the prestigious Herb Alpert Award in Theatre and was a resident playwright at New Dramatists, where she won the Helen Merrill Award and the Whitfield Cook Award, among others. She has received fellowships from Sundance/UCross, Yaddo, the MacDowell Colony, Cave Canem, Williams College, and the Doris Duke, Van Lier and Mellon Foundations. As an actor, she is an Obie Award winner for Sustained Excellence in Performance. Ruth Ellen Kocher is the author of seven books of poetry, including Third Voice (Tupleo Press, 2016), Ending in Planes, winner of the Noemi Poetry Prize, Goodbye Lyric: The Gigans and Lovely Gun (The Sheep Meadow Press, 2014), and domina Un/blued (Tupelo Press 2013). Her poems have been translated into Persian in the Iranian literary magazine She’r, and have appeared in various anthologies including: Angles of Ascent: A Norton Anthology of Contemporary African American Poets; Black Nature; From the Fishouse: An Anthology of Poems that Sing, Rhyme, Resound, Syncopate, Alliterate, and Just Plain Sound Great; and An Anthology for Creative Writers: The Garden of Forking Paths. She has received grants and fellowships from the National Endowment for the Arts, Yaddo, and Cave Canem. She is currently an Associate Dean for the College of Arts and Sciences at the University of Colorado at Boulder where she teaches Poetry, Poetics, and Literature in the undergraduate and MFA writing programs. Interdisciplinary artist and educator avery r. young is a 3Arts Awardee and one of four executives for The Floating Museum. His poetry and prose are featured in several anthologies, including The Golden Shovel Anthology and The BreakBeat Poets. Most recently, his poetry is featured in photographer Cecil McDonald Jr’s In The Company of Black (Candor Arts). He is the featured vocalist on flutist Nicole Mitchell’s Mandorla Awakening (FPE Records) and is currently touring with her Black Earth Ensemble and his funk/soul band de deacon board. Young’s first collection of visual and traditional poetry, neckbone (Northwestern University Press) will be released Spring 2019. Check out CAAPP's events archive for photos and videos from recent Center events. 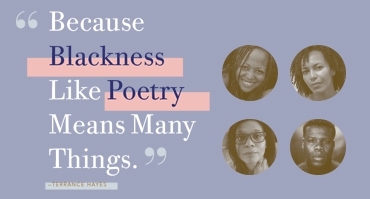 The mission of the Center for African American Poetry and Poetics (CAAPP) is to highlight, promote, and share the poetry and poetic work of African American and African diasporic writers. Learn more.